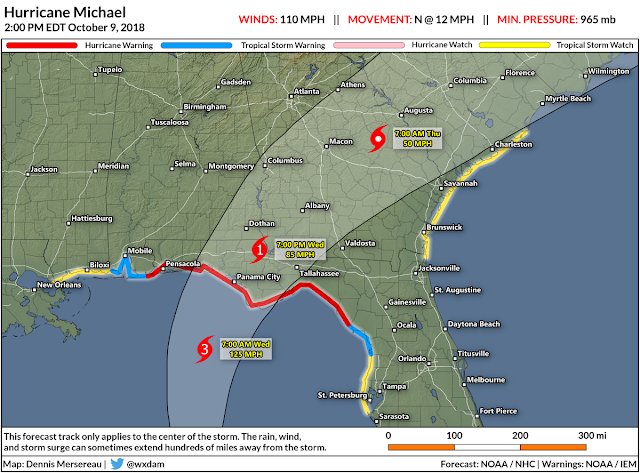 It can be deceptive to look at a hurricane forecast map if you live inland. The way watches and warnings are drawn for areas in the path of a landfalling storm can be deceptive. The National Hurricane Center's official products only show warnings as thick, colorful lines drawn onto the coast. This can lead to the perception that people who are dozens of miles away from the coast are safe. That's a worrying mistake to make. Hurricane watches and warnings can extend far inland from the coast, and that's very much the case for Hurricane Michael as it approaches the northern Gulf Coast this week. 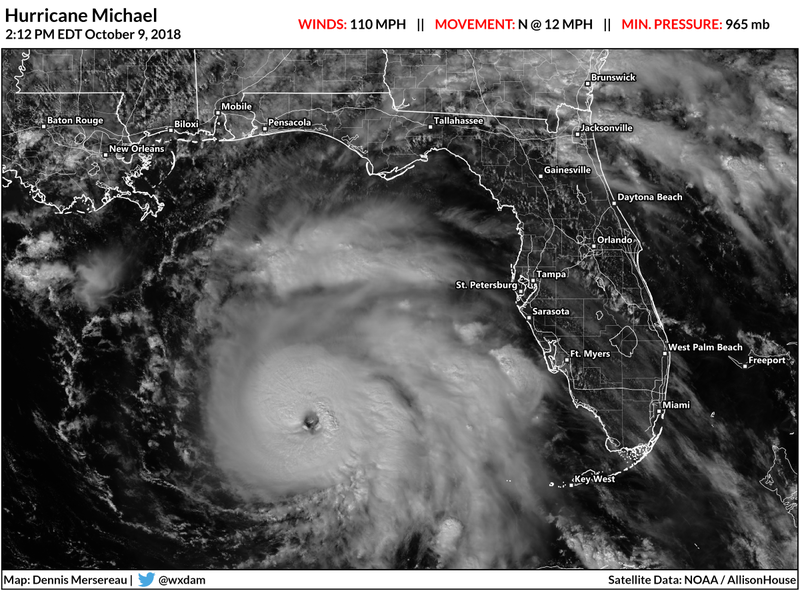 Hurricane Michael is growing more organized as it moves through the open waters of the eastern Gulf of Mexico. The storm had 110 MPH winds at of 2:00 PM EDT Tuesday, and it's starting to look more like a formidable hurricane with each passing hour. 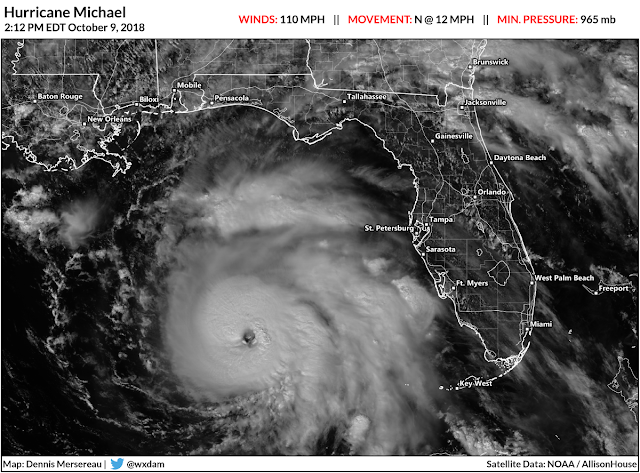 The latest National Hurricane Center forecast shows Michael's winds reaching category three intensity by landfall on Wednesday. Forecasters expect the hurricane to make landfall on the Florida Panhandle somewhere around Panama City, but everyone from Pensacola to Tallahassee is within the cone of uncertainty, or the margin of error in a hurricane's track based on previous years' forecast errors. A hurricane doesn't (well, most hurricanes don't) fall apart as soon as their eye crosses the coast. The destructive winds and heavy rain can keep roaring inland, even days after a storm makes landfall. One of the biggest mistakes we can make is expecting a hurricane's ill effects to only unfold right at the coast. As we've seen from recent storms like Harvey and Florence, flooding rains can stretch far inland and lead to disaster. But a storm's strong winds can also follow a storm's path as it treks across land. The coastal highlights give you a good idea of which areas are under a warning, but they're deceiving for inland areas. More than a hundred counties from Mississippi to South Carolina are under some form of watch or warning ahead of Hurricane Michael. 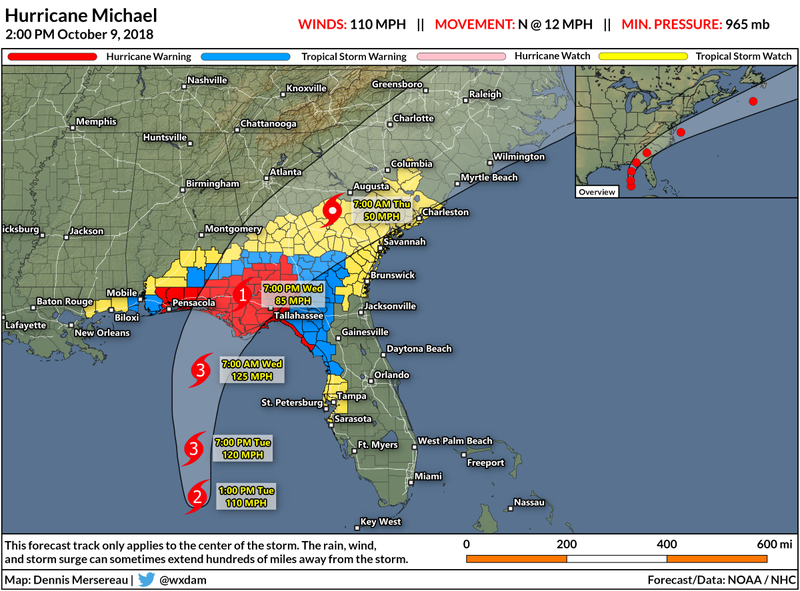 Hurricane warnings and tropical storm warnings extend into southwestern Georgia and southeastern Alabama, including the cities of Tallahassee, Dothan, Albany, and Valdosta. Tropical storm watches stretch as far as central South Carolina. I understand that it's challenging to make a simple map that's also able to cram that much information into one area. 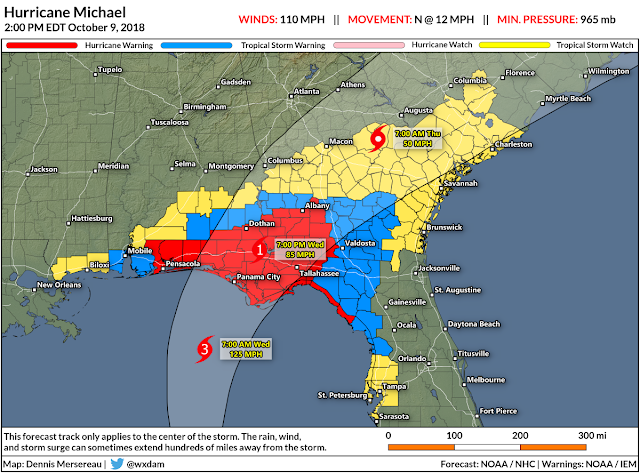 The NHC's official map would be an absolute mess if it included all the counties under watches and warnings. That's one of the reasons I make my own maps for my articles. Tinkering with the data usually allows me to display more information than most other outlets, such as cities and highways and inland watches and warnings. The simple act of issuing a hurricane warning for counties dozens of miles from the coast isn't something to take for granted. 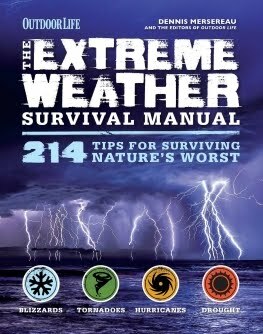 Not that long ago, some National Weather Service offices would simply issue a "wind advisory" or "high wind warning" for inland areas along the path of a landfalling tropical system. Getting rid of that kind of inconsistent messaging is one of the small changes the NWS has made in their effort to simplify the warning process and make things easier for people in harm's way to make quick and effective decisions.